Hello Everyone! This weekend was ARG states and I had been searching for a powerful and fun deck to play at the event. For the past month now, my team has been working to develop a powerful Vlad list but unfortunately it has some issues that have not yet been worked out. I decided to play something different at states and began looking for deck ideas. The Friday night before the event, I finally had a revelation about what I wanted to play and began brewing up a list. I spent the next day texting my teammates and tweaked the main and sideboard a bit until I was satisfied on the final list. After seeing the list, I know what you are thinking, I am crazy for playing the original Alice and yes I am a little bit. I have always liked her as she does so much when she flips and provides an amazing amount of utility. With Ruler’s Memoria being a fairly easy stone to build around, it was not difficult to play many of the best cards in the game in one deck and be able to Judgement Alice for any color I wanted. To run ruler’s Memoria and ensure a consistent untap on turn one, the deck needs to run 8-10 regalia. I chose to run 9 and I think this was a good number for the deck. Percival makes finding more regalia easily and also works very well with Lancelot which is one of the best resonators in the game. Another one of the most powerful resonators in the game. This card allows you to tutor for any red resonators in your deck. This finds Lancelot easily and I also included a small package of other utility resonators I played that could be searched up if needed. I took 4 of the best 1 drops in the game and put them all in the same deck. Cheshire helps improve consistency of the deck and chump blocks almost everything in the format. She provides more draw power for the deck and works very well with Rukh egg and Cheshire Cat. He’s one of the best resonators in the game. Left unchecked, he can very easily win the game and provides a very fast clock any point in the game. His ability to pump himself and kill opponent’s resonators makes him even more of a threat and powerhouse. I anticipated a lot of Reflect/Refrain and Change the Worlds so I felt this card was very good and slowing down those decks and giving us more draw power. It also destroys Deathscythe which was very helpful as it was brought in against us several times. I always liked little dread a felt she provides some useful utility. I tried her as a one of and was sadly underwhelmed with how she performed. She costs too much and she does not impact the board enough to truly be worth a slot in the deck. This card was in theory a blowout against aggro. Especially with Perceval, you can use this card to wipe your opponent’s field and then swing back with the giant resonator. I only got to play the card once but I won the game when I did. This was a 1 of against control. It gives you a large threat that continuously returns and drains your opponent of their removal spells. The card was nice but I feel was a bit expensive to be played in the deck. This card punished Gwiber very hard. It is a large powerful beater that can put a great deal of pressure on the opponent. With so many people playing Gwiber this card was very helpful. To run Ruler’s Memoria and ensure I had a regalia turn 1 I felt 9 was a good number to play. Laevateinn gave Alice swiftness which was very useful on allowing her to be aggressive when she flips. It also provides a way to banish our Rukh Eggs and Cheshire Cats for value. Excalibur was another source of Imperishable and gave Alice another pump when necessary. The target attack was also very useful in enabling Alice to kill several resonators. Deathscythe slowed aggressive rulers, like Bahamut, down and also provided another pump for Alice. Horn gave the deck a way to go into the long game without decking and also provided a pump for Alice. This card with Lancelot is an incredibly fast clock and can be very difficult for an opponent to recover from in left unchecked for a few turns. It also can turn any of our other resonators into larger more powerful threats. It also makes chump blocking very unfavorable which helps get more damage through. This was somewhat a filler random card that ended up being very useful. I killed annoying blockers like Adambrali and caught the opponent off-guard. I’m not sure if it’s worth playing moving forward but it was useful in several games. 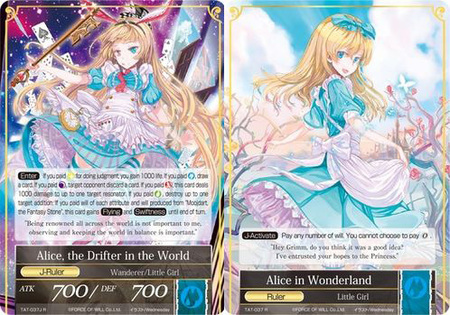 Ruler’s Memoria allows the deck to flip Alice for any color as well as play card in any color without stumbling with the mana base. Little Red provides another way to pump Lancelot or any other resonator of the chosen color. Heat Ray and Hearth’s Core gave the deck access to the colors it wanted early without dealing damage to ourselves. This was for against Alice World. I provided a large aggressive ruler that could apply a decent clock and was able to dodge the chump blockers on the ground. I found her to be too slow honestly and I liked just keeping Alice in to destroy any Robes that I saw. This card was extremely useful and I sided it in most matchups. I was able to destroy any problematic addiction like Barrier of Shadows or Robe of Fire Rat. It also protected my Resonators from removal and at worst it was able to filter for another card. Another piece of removal for annoying blockers like Adambrali that are difficult for our resonators to get passed. For other aggressive decks. I did not play against any other red aggressive decks but this card was played against me and was very good. It is just as good against any other aggressive deck. Helps protect against slower removal like Hastur or Susanowo. It also protects resonators that aren’t attacking from removal spells. Mainly for the Val 2.0 matchup to slow them down significantly. Could also be very good against Reflect as a way to slow down orbs and its Judgement. The deck was very cool and was playing Green Black Red (I’m going to call this color combination Jund moving forward). The deck has a good amount of removal but, my deck was too fast for it and beat it game 1. Game 2 I resolved an early Realm of Pure Spirits and opponent had a difficult time slowing me down. The game ended with me playing Arthur Pendragon and on my opponent’s recover phase tapping Arthur and sacrificing a Perceval to it to prevent all damage to it. It wiped his field and I was able to swing in for the win on my turn. I was happy to see a Vlad player. She is one of my favorite rulers and was excited to see his list. Game 1 my opening hand was Laevateinn, 3 Lancelots, and a Cheshire cat. My opponent was able to discard 2 of the Lancelot but I drew a Rukh Egg turn 3 and there were too many Lancelots for him to stop. Game 2 he resolved an early Robe of Fire Rat which slowed me down. I was able to play 2 Heras and was able to apply pressure with them. I Judgemented Alice shortly after that for green and destroyed the Robe and was able to overrun him afterward. I honestly was not expecting pumpkin witch at all. The deck played just like Alice world so I expected that but what very surprised when he played pumpkin which and the chained Adambrali until I died. Game 2 I sided into Sylvia and after a tense game with lots of hate from his side I was able to swing for 30 and kill him in one shot. Game 3 he had 2 Robes of Fire Rat by turn 3 and there wasn’t much I could do before he combed out and killed me. Game 1 I didn’t not mulligan enough and flipped a Ruler’s Memoria turn 1 with no regalia and he played 3 Change the Worlds and then Law of Silenced me 2 turns in a row. He then proceeded to combo off and kill me with pumpkin witch. Game 2 I had an aggressive start with Lancelot and, when he played a robe of Fire Rat, I Judgemented Alice and destroyed it. Game 3 I did not get a Ruler’s Memoria until turn 4 and a Robe of Fire Rat kept my lance in check until he could combo off. At this point, both of my other teammates that came to the event were 2-2. I was unfortunately was paired against one of them this round and I knew one of us was not going to have a chance to top 8. Game 1 he combed out quickly after turn 2 playing a Gwiber. Game 2 I rushed with Lancelot and overran him before he could go off. Game 3 was very tense and I had lethal on board. He top decked an Alice World and won. I place 16th out of 29 people which I was ecstatic about, especially with the deck I was playing. I was genuinely surprised to see pumpkin witch and did not expect to see that at the event. I was honestly floored with how useful Alice was all day. With Laevateinn, she could kill Gwibers for 1 mana, she was able to remove any problematic addition on the field and can gain life to help race an opponent. I did not expect her to perform as well as she did and was very happy that she did perform well. Moving forward I do have some flaws with the deck. Cthugha was a card I was hesitant to play but after playing the deck, I really want to play this card. It provides an explosive aggressive start especially with Rukh Egg. I originally wanted to fit Adambrali onto the deck but had trouble finding a place and was concerned he did not have swiftness. After seeing pumpkin witch I think I can shift the deck around to fit him in the deck as well. Rapid Growth did not do much and I found myself siding it out most games as well as Little Dread and Blazer. These cards did not do enough and I will definitely be cutting them moving forward. After the event I spent some time looking at other results and have some ideas for improving the deck. I was so impressed with the deck and seriously feel it could do well. The real issue I have is combo decks are tough to play against. In any card game, combo decks are a tough and stressful deck to play against as they have the potential to win at any time. I have played Magic for many years and have loved the modern format. There are several combo decks (or there were before the banning) in the format and the most prevalent one was called splinter twin. For those that are unfamiliar with magic, modern or the Splinter Twin deck, the deck played a control/tempo deck the tried slowing the opponent down and applied some pressure with a few creatures (resonators) until they either killed their opponent or they combed out which was creating an infinite amount of creatures with haste (swiftness). The deck was powerful and I played it for many years myself until I began playing this game. The combo decks in this game feel like they play a very similar way which is great and really fun. It makes it stressful for an opponent who is not playing a combo deck as the real option to beat it is to run them over before they have the chance to combo off. I feel this was the main reason I had a tough time beating my 3 combo opponents. My deck was decently aggressive but not aggressive enough to really ensure a kill before they have enough time to win. I am happy that I did play against these decks enough and I was able to see the issues with my deck. I now have a much better idea of what the meta is going to look like before the new set releases. I am definitely going to continue looking into this deck as it truly did perform above and beyond my expectations and I feel a simple tweak into a more aggressive deck will help it be able to beat the combo decks in the meta. I hope you enjoyed reading about my experiences and I really suggest trying the deck out yourself. I was blown away by it and had a ton of fun playing the deck (it also turned so many heads during the event. Nobody expected Alice at all!) It impressed people enough that I was asked to do a deck profile for a YouTuber that was at the event. Check out his channel, Deep Wood FOW, as well as my deck profile below. Thank you all for reading and check out our podcast, On the Chase, on Friday where me, Lane, and Gerds talk about our experience at states!